A new feature on Facebook, is all set to ramp up the experience of listening to music online. ‘Listen with Friends’ as the feature has been christened, allows Facebook users to listen to music at the same time as their friends and discuss the tunes using Facebook Chat, with PC Mag reporting that up to 50 people will be able to listen and talk about the tracks at the same time. Facebook product designer Alexandre Roche, in a blog post dated January 13, 2012 mentioned that- You can listen to the same song, at the exact same time - so when your favorite vocal part comes in you can experience it together, just like when you're jamming out at a performance or dance club. 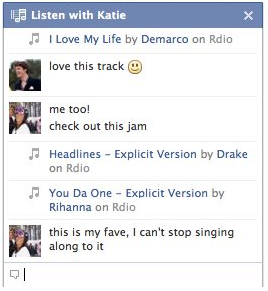 ‘Listen with Friends’ being a part of Facebook Chat allows users to chat online about what they are listening to. Users can also listen in as a group while one friend acts as a deejay. Up to 50 friends can listen to the same song at the same time, and chat about it. Everytime a user begins listening to music with a friend, a ‘story will be posted to her/his friends’ ticker and/or news feeds. Users will have control over who will be able to see when they are listening with a friend through their App Settings page after installing the compatible music app. The service however can only be leveraged if both parties involved have access to the same online music programmes. Currently only Spotify and Rdio can be used in conjunction with 'Listen with Friends', although ZDNet claims that more services are set to be announced in the future. The new feature created from collaboration between Facebook and Spotify gives users access to over 15 million songs, and will also allow them to see what tracks are trending on the site, as well as letting users share music with friends, as part of a free service. So if you weren’t addicted to Facebook already, here’s another reason to stay hooked on to this social networking website.